I think it's probably unlikely that there are more planets between Mercury and Mars, but out from Jupiter, there's lots of empty space between the planets. Could there be some small planet hidden out there? There are no undiscovered planets between the sun and Neptune. Objects closer (to Sun) than Neptune that are large enough to be considered planets (and not dwarf planets) can't remain 'hidden'. If it's there, the light from the sun will bounce off it and we will see it. As it moves in its orbit, we will notice the position in the sky change, so we will know it isn't a star. I would like to give a more broad answer to this question though: What is the maximum size of an undiscovered solar system object and how does it change as you get further from the sun? 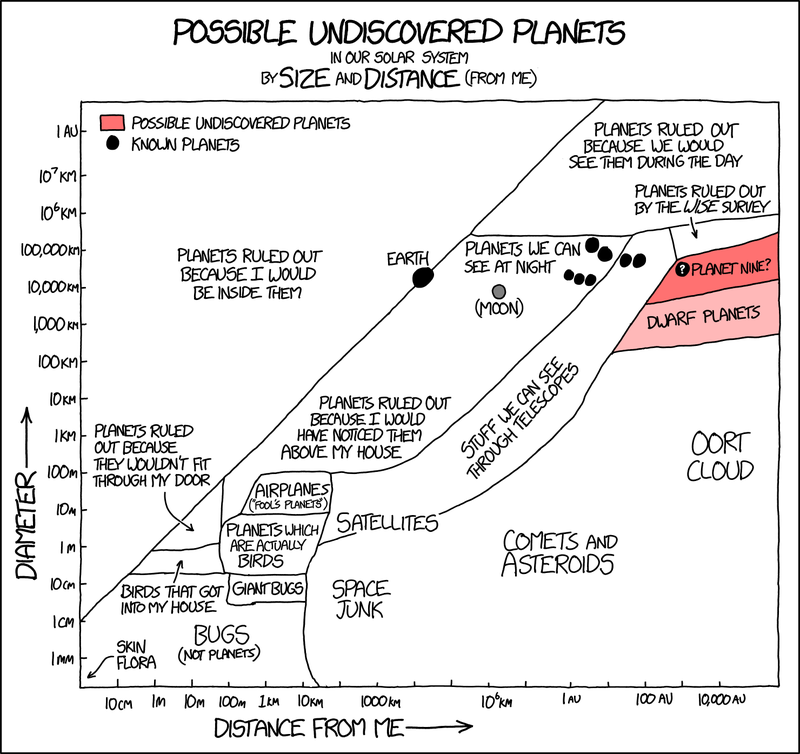 The further out a solar system object is, the harder it is to detect. The rate at which it gets harder is severe; the light we receive from an object scales roughly as $1/r^4 $. ($1/r^2$ for the light travelling from the Sun to the object, and again, $1/r^2$ for the light travelling from the object to us on earth). We are able to detect some very small earth-crossing asteroids. Some as small as ~50 metres across. At a guess (and this is just based on my intuition, not any calculations), there are probably no undiscovered objects larger than 1 km close to earth. As you travel to the outer solar system (Jupiter to Neptune), the number of bodies increases dramatically. There are currently ~700,000 known solar system bodies and most of them occur in this area. It is believed that all asteroids larger than 10 km have been found. In the area immediately beyond Neptune (30 AU to 100 AU), we have been finding many pluto-like objects in the past two decades, objects with diameters of 500 km or more. For reference, Pluto is about 2200 km across. It is entirely plausible that there are some, if not many, similar objects at this distance range that have not yet been found. Some of these would classify as dwarf planets, in that they are round, orbit the sun, but have not cleared 95% of their orbit of other matter. And finally - and this is where it gets exciting - where it gets really far out, there may be an undiscovered large planet, out at ~700 AU. Referred to as Planet Nine, this is a hypothetical object that some (noteworthy) astronomers believe exist because of patterns they see in the orbits of other distant dwarf planets. From calculations, they estimate that it would be as heavy as 10 earths and travel between 200 and 1200 AU. However, these distances are so large and the sunlight out there is so dim, that even with the best telescopes and two years of looking, they haven't found it. Finally, I'd like to share two graphs. The first one is of distance (of closest approach, or perihelion) vs diameter of various outer solar system bodies. In the bottom right corner there is a noticeable lack of dots, indicating roughly where we don't yet have the capability of seeing objects that small and distant. The second is an expanded but slightly less accurate diagram of the same. Image 1 from Johnston's trans-Neptunian objects page. Image 2 from xkcd. Not the answer you're looking for? Browse other questions tagged planet solar-system or ask your own question. What effects do other planets have on the solar system? Is there a prediction when our solar system would fall apart? Isn't it likely that most extra solar planets don't transit their star in line with the Earth? Could a planet be toss from a galaxy just like it's theorized rogue stars are? When it was discovered that the classical planet are not stars? Is it likely that intergalactic stars would still retain their planets?